Tindo Solar is Australia’s only manufacturer of solar panels. While they are not a producer of tier one panels, which are what I normally recommend people buy, Finn has been to their factory and checked out their production and he was impressed enough to put 24 of them on his roof, so I think that is a pretty good endorsement of their quality. Tindo Solar panels have a 12 year product warranty and a 25 year performance warranty. They are corrosion resistant and that makes them suitable for installation in coastal areas. At last count Tindo Solar employs around 25 people and is located in Adelaide. Tindo Solar was founded in 2011. Their Adelaide factory has a manufacturing capacity of 60 megawatts. This definitely makes them a small producer of solar panels. If they operated at 100% capacity it would take them over 120 years to produce as many solar panel capacity as Australia has now. The company was bought by South Australia's Cool or Cozy insulation and energy efficiency company in March 2017. Since then it has increased its manufacturing capacity from 30% to 50% increase staff from around 25 to about 40 people. Tindo Solar assembles solar panels using imported solar cells. Tindo's Karra series panels range from 285 to 300 watts. Their efficiency is from 17.1% to 18%. The hotter a solar panel gets, the lower its efficiency. The value that gives how much a panels efficiency drops by for each one degree increase in temperature over 25 degrees is called the Max Power Temperature Coefficient, or alternatively it’s called the Temperature Coefficient of Pmax. A typical value is -0.4%. This means if a panel’s temperature is 35 degrees it would produce 4% less electricity than if it was at 25 degrees. Tindo's Temperature Coefficient of Pmax is 0.41% which isn't great, but isn't bad either. It's fairly typical. The very large majority of tier one panels have positive tolerance. This means the panels wattage will be its rated amount plus a small amount, for example 0 to 5 watts. Tindo panel’s power tolerance is plus or minus 3% which means its actual wattage could be up to 3% above or 3% below its rating. As a result, the actual wattage of Tindo panels will on average be slightly lower than that of panels with positive tolerance. Tindo says they plan to make their next panel with positive tolerance. In 2014 Tindo Solar instigated an an anti-dumping case against Chinese solar panel manufacturers. It did not succeed. If it had it could have resulted in punitive tariffs being placed on Chinese panels. This would have helped Tindo Solar and its 25 employees, while harming the rest of Australia’s solar industry by raising the cost of imported panels. If you want Australian made solar panels then Tindo Solar is your only choice. If you want quality, reliable panels, then you'll also get them with Tindo Solar. While they are a small producer and will most likely never be a tier one solar panel manufacturer, I am satisfied that if you install their panels you will be very unlikely to have a problem with them. Tindo Solar panels do carry a premium as the only Australian made panels, but that’s a small price to pay to support Australian manufacturing. Very happy with the panels, what more can I say?!! They are working perfectly with no problems. we are now making more power than we use. Seem to generate at or slightly above promised level. Have been pounded by cricket ball sized hail and not missed a beat. And they are Australian made, so whilst a bit more expensive, seem to be very high quality and some kid in Adelaide gets a job, which we need before we lose our ability to manufacture anything more complex than a cardboard box. Although a little more expensive than other companies, I would strongly recomend Tindor to those looking to install solar. Great simple installation that was done within a fortnight of order. All works were completed on the day. The solar analytics monitoring is just great for checking hour your place is running and really helps you optimise where you use your power. I now fully understand the issue with my house is the three phase air con. We sort of new knew it but with solar analytics we now know it for sure and have data to support its replacement. Very happy with the help Tindo provided on sizing our system and the performance of it. Just very very happy with the service and installation. The panels are performing at a better rate than was estimated by the sales man (most unusual). The installation was performed by the most professional workmen that I have every had work on my property. Tindo solar panels have a fantastic LONG guarantee! They are made right here in South Australia. They have an awesome monitoring system that let's you track usage & what you have produced. This can also be used to monitor performance so 'if' anything is not performing, the Company is notified as well as you! In the first quarter (in Winter) I saved OVER 2/3 of my energy bill. 6 weeks into my quarterly power bill and it’s already halved ! Best investment I’ve made to my house. The solar analytics app is amazing, I can watch the solar unit earn in 5 second intervals plus see my import/ export to and from the grid . Keep up the good work tindo. Tindo Solar have been absolutely fantastic. After 4 months of having our Tindo Solar Panels - we have already had a reduction of $200 in our Electricity Bill.!!!! It was the best money we have ever spent and the panels will pay for themselves in no time at all. Thank you to Sam and Darryl. Absolutely fantastic to deal with you both and Tindo Solar in general. 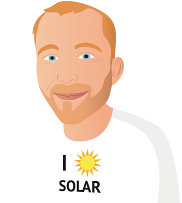 Will recommend you to all family and friends considering Solar Panels. N/A We had 16 panels with Solarbridge inverters installed a 4 years ago. The inverters began to fail 2 years a ago and have been replaced a number of times. Now we have yet more failures and 5 are off line, that was 6+ months ago ! Totalling all the failures we have now had 50% of the inverters stop working. The installer "Australian Home Services" went out of business in 2017 so warranty fell to Sunpower/Tindo. Sunpower said they'd replace all the Solarbridge inverters with Enphase but not the control unit. I told them if you replace all the MIs then you have to replace the monitor too. If you don't then it is "not fit for purpose" under ACC consumer law since the entire installation forms a system. They then agreed to supply a new monitor too. Sunpower shipped the replacement parts but no installer has turned up to fix the system. I'm informed by Sunpower that Tindo are responsible for arranging the installer and I'm still waiting. Given the other reviews on here having similar issues, maybe its time to consider action to be brought against Tindo for failing to honour warranty. So, 8 months and waiting! i am extremely satisfied with my panels which are all individually separate from each other and monitored all separately, in other words if 1 is affected in any way it will not affect the others and will alert the company that one is on the blink, thankfully all are working perfectly and have given me a tremendous amount of savings $$ and they do what they say, I have the enphase system and could not be any happier, installation was quick and thourough and the workmanship was of high quality , after taking a tour of the factory at mawson lakes it was apparent to me that these guys mean business with their quality product, all locally made , it just couldn't get any better, I would not hesitate at a moments notice in recommending tindo solar to anyone who is looking at getting solar power for their home , I researched for months from the top grade silicon and the panels and the workmanship and found these guys were the best and local as well, go look for yourselves in the factory , you will be amazed.. regards phil , more than satisfied customer..
Our Tindo Solar Karra 250W solar panels have been faultless since installation in May 2013. We have experienced problems with our SolarBridge micro-inverters but Tindo Solar have been responsive in honouring the warranty and replacing affected units. Our 22-panel system is operating perfectly. Great company to deal with. They made the process of installing Solar panels trouble free and did everything they said they would. Although our panels are still relatively new, to date, they have performed very well.